Now it's time for the second round of masks!! I just randomly pick the masks whenever I feel like I need to add an oomph to my routine. Though with the combination of the Hyaluronic Acid and the abalone cream, my face has been pretty nice so I haven't gotten around to using masks lately. Now, I don't normally do movie reviews as I don't go and watch new movies often. The ones I usually watch in theatres are animated ones, usually by Pixar. But I couldn't resist on doing a post on the new Cinderella film starring Lily James and Kate Blanchett. Why? Because Cinderella is my favourite fairy tale of all times. No, not the Disney's happy ending, but rather the original story with the three balls and the bloody endings to the evil stepmother and the stepsisters. A short review without spoilers is that this is a nice family movie with gorgeous settings and costumes. The story line is rather lacking in my opinion but it is a good movie for the younger kids with good morale behind it. Now click ahead to get the detailed review, full of spoilers. Yes this is an extremely belated post for my TK haul #2 that was made in January. This was placed a week after my first haul and shipped out a day before #1 shipped out. So they arrived around the same time as each other. This one was purchased for various reasons. 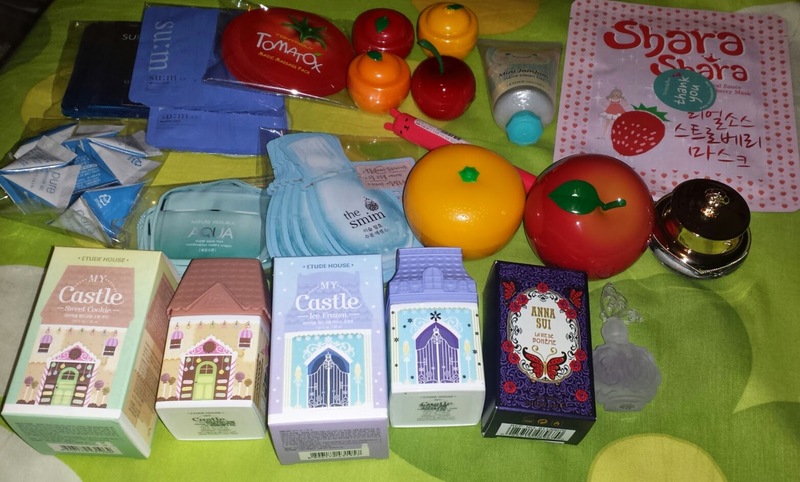 1) I wanted to try some samples, 2) I needed a reason to get the castle hand creams and 3) to get some cute fruit shaped items for a friend's birthday present.